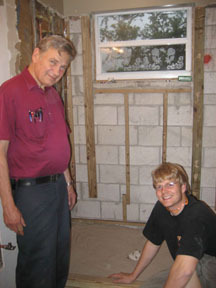 Ken is here this week helping Jon with the bathroom. They’ve been at it for two days and are making progress. As I write, they are building the shower pan, occasionally it sounds like the ceiling is going to come down. Here are some pics (hope you find pipes exciting) . . . This entry was posted on Friday, June 1st, 2007 at 9:28 pm and is filed under Family. You can follow any responses to this entry through the RSS 2.0 feed. You can skip to the end and leave a response. Pinging is currently not allowed.